The canvas or ‘canvassing’ of a suit refers to the inner layer of a suit which is situated in between the outer fabric and the inner lining. If a suit is canvassed, this usually refers to the horsehair canvas that is stitched onto the chest piece which sits between these two layers. As standard, all Pocket Square suits are half canvas. Each garment consists of four elements. The outer layer (the material which you choose), floating chest piece, canvas and the inner lining. 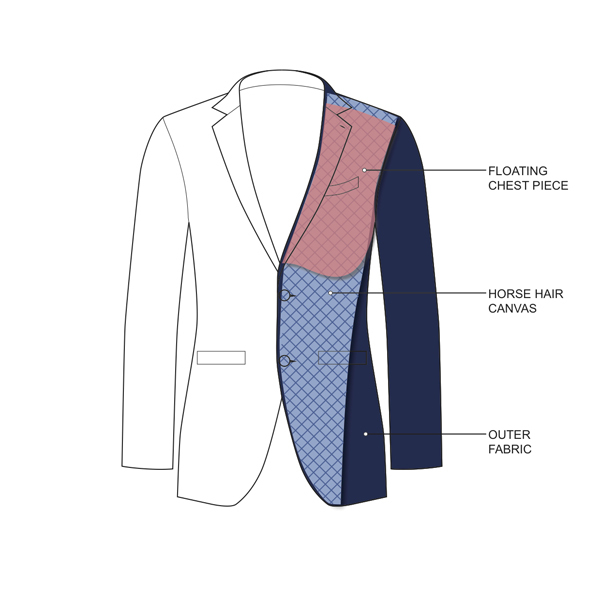 The suit is constructed with a thin chest piece around the chest area, and stitched above this is this horsehair canvas which extends from the shoulder to the bottom of the chest and the lapel. It is this horsehair layer that gives the suit a natural drape on the body. As the name suggests, only half the suit has a canvas and therefore, from the bottom of the chest down to the bottom of the suit, the outer layer and the inner lining are fused together. This construction ultimately offers the best of both worlds – the contouring drape along the chest and the affordability which won’t blow your hip pocket. When it comes to suits, the full canvas construction is the epitome of quality. Ask any suit enthusiast and they will tell you that full canvas is the best suit one can pamper themselves with. Similar to the half canvassed construction, the suit consists of four elements - the outer layer, floating chest piece, horsehair canvas and the inner lining. A full canvassed suit is constructed with a horsehair canvas which features across the entire length of the jacket and the lapels. Over time, the inner canvas will conform and shape accordingly to your body, resulting in an impeccable and natural drape. 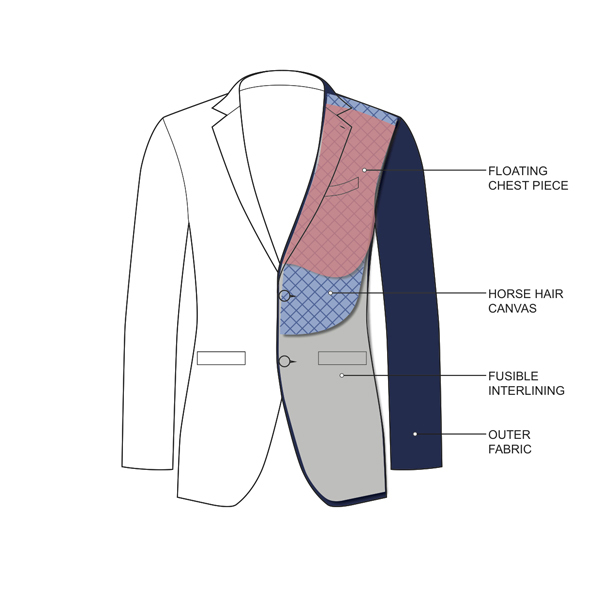 Pocket Square customers are provided with the option of a full canvas construction under ‘additional options’. Many off-the-rack suits are generally ‘fused’, signifying the absence of this horsehair canvas and just as the name suggests, the outer layer and inner lining are fused/glued together. Fused suits are generally much cheaper to produce compared to a half or full canvas suit and such, are more widely offered – even by the most expensive of brands. However, there are many downfalls of a fused suit compared to one which is canvassed. A fused suit will not drape as well as a canvassed suit as they are normally much stiffer and therefore, will feel rigid and unyielding when worn. They also do not last as long and over time, the glue will begin to deteriorate and cause the suit to bubble. Rest assured, at Pocket Square, we don’t supply fused suits and we believe every man deserves the best in quality. Define your style by selecting from four different lapels. 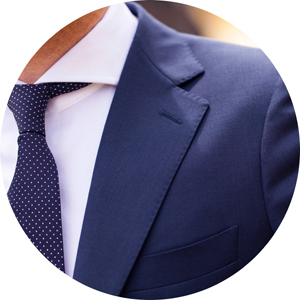 Notch lapels are the most common and versatile and can be worn both casually and formal. Peak lapels are traditionally more formal but has made a comeback to the everyday office wardrobe in recent times. Shawl lapels are usually only seen on tuxedos. All our lapels have the following standard width at the widest part - standard notch 8.0cm, slim notch 7.1cm, Peak 8.3cm, and 8.0cm for shawl. It’s the finer details that bring out the sartorial brilliance in each of our suits – the pick stitching, the functional buttons, the accent boutonnières, the five kissing buttons. That is why all our suits come standard with a 'barchetta' or arc breast pocket, which is a signature of fine Italian tailoring. If you look at most suits, you will notice the chest pocket of many jackets are straight or angled. These look out of place and do not follow the natural curves of the chest. The barchetta breast pockets have a slight angle which gives the suit a sleek and streamlined appearance. 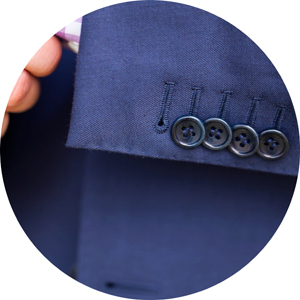 Functional buttonholes or 'Surgeons Cuffs' are a hallmark of a well-tailored suit. All our suits come standard with functional buttonholes. Off-the-rack suits generally have imitation sleeve buttons, meaning that they are there just for the look and cannot be unfastened. Consequently, the sleeves are sewn together and cannot be opened. Functional buttonholes indicate that the buttons can be unfastened and subsequently rolled up if required. We suggest you leave the last button unfastened to quietly show off your new tailored suit. Your sleeves will never be too long again and your collars will always button up nice and snug. All of our shirts are fully customisable and are made just the way you like it. You decide on the design of the collar, cuffs, plackets and back pleats. Pocket Square shirts are made from 100% cotton, ranging from 50*50 single ply to 100/2*100/2 two ply. Many people believe the higher the weave count, the better the fabric is. However, this is a common misconception as it purely comes down to the design, weather and occasion. 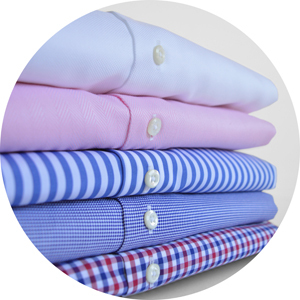 100% cotton shirts allow for breathability whilst remaining durable and comfortable the more you wear it. Just select the design and start customising.